There are many out there questioning Sears’ ability to survive in the retail market, including executives from Sears itself. Further evidence of the retailer’s struggle surfaced in an announcement made Thursday, which detailed the closing of 20 more stores in several different states. The decision to close these locations brings the total number this year to 235. According to Business Insider, the total number of stores has diminished to 1,180 from 2,073 five years ago. Chicago, IL – 1601 N Harlem Ave.
Overland Park, Kansas – 9701 Metcalf Ave.
Cockeysville, Maryland – 126 Shawan Rd. Hagerstown, Maryland – 17318 Valley Mall Rd. Roseville, Mich. – 32123 Gratiot Ave.
Burnsville, Minn. – 14250 Buck Hill Rd. Albany, NY – 1425 Central Ave.
Mentor, Ohio – 7875 Johnnycake Ridge Rd. Middleburg Heights, Ohio – 6950 W 130th St.
Toledo, Ohio – 3408 W Central Ave.
Warwick, RI – 650 Bald Hill Rd. Greendale Wis. – 5200 South 76th St.
On top of all its store closing news, Sears did offer one brief glimmer of expansion on Thursday. 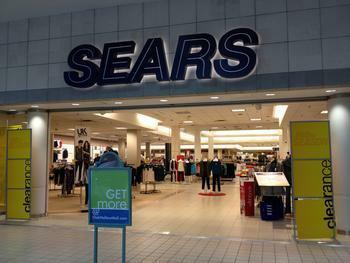 The company announced the opening of its first Sears Appliances & Mattresses store in Pharr, Texas. The new store will allow consumers to meet with experts for scheduled appointments and provide flexible options for ordering and picking up purchased items. The grand opening which is currently underway offers discounts of up to 40% on appliances and up to 60% on mattresses.